Selling, recycling or donating an old cell phone keeps it out of electronic garbage dumps like this one in Dobbspet, India. (CNN) -- Whether they're waiting in line Thursday for a new iPhone 4 or grabbing other recent smartphone offerings such as the Droid Incredible or Microsoft's Kin, plenty of folks will be saying goodbye to their old phones in coming days. But what to do with that once-trusty piece of pocket technology when it's replaced by a sleeker, faster, fancier newcomer? For financial and environmental reasons, everyone agrees you shouldn't put your old phone in the garbage. So here's a look at some options for your old phone when the new phone comes calling. Some of these will even make you money. Environmental advocates point to cell phones as some of the worst things you can toss into a landfill. Mercury, cadmium, lead and arsenic are among a typical phone's components, and all spell bad news if they make their way into soil or water supplies. Recycling those substances can help the environment on the front end, too, said Jennifer Krill, director of Washington-based environmental group Earthworks. "If we can divert some of this waste from cell phones away from landfills [and resell it], we don't need to blow up mountains in order to mine these minerals," she said. The Environmental Protection Agency estimates a half-billion unused cell phones are in the United States. Earthworks is one of several national groups that run cell-phone recycling programs. The "Recycle My Cellphone" campaign lets people mail their phone to the group and works with schools and other local groups on collection drives. Earthworks pays about $1 a phone collected in those drives and then either resells them if they're in good working order or processes them and sells the minerals and other components. While they get their fair share of flip-phones and other outdated tech, Krill said it's surprising how many iPhones and other relatively new smartphones they see. "Smartphones have been around for enough years now," she said. "If it's reusable, we try to put it back in the market, but usually it's used for components." Sure, there's always eBay and craigslist, and those traditional online markets are probably going to make the seller the most money [which, presumably, will be going toward the new phone]. But there are other options out there for folks who don't want to have to wait for a buyer, haggle over prices and set up a meeting or mail exchange to seal the deal. RadioShack will be an iPhone vendor for the first time and is offering a buyback deal on customers' current phones. On the company's official Twitter feed, it announced that it will be offering gift cards for used iPhones -- part of a "trade and save" program that awards cards for other electronics as well. The electronics chain offers cards of up to $200 for a used iPhone 3GS in good condition and nearly $100 for a 16 GB 2G iPhone. Among other phones, a BlackBerry 8900 Curve in good shape gets a $52 card and a Droid can get the customer about $82. For over a week, answers to questions about the new phone and the gift-card deal have dominated the Radio Shack Twitter feed. The pending iPhone 4 release has ramped up interest in online technology brokers, too. The electronics resell site Gazelle reports that 10,000 iPhones were traded in during the week beginning June 7, the day Apple CEO Steve Jobs announced the new phone. The site lets people punch in information about the phone or other gadget they want to sell. Based on the going rate at the time (on sites such as eBay), Gazelle automatically offers a price and if the deal is made, takes the item, wipes data from it and resells it. "We're trying to make it as easy as Netflix," said President and Chief Operating Officer Israel Ganot told technology blog CNET. Communities everywhere have programs that let people donate their old cell phones to charity. Senior centers, shelters for abused women and support groups for people with physical and mental disabilities are among the groups often seeking phones for their clients. But be sure the organization you want to help needs the phones. 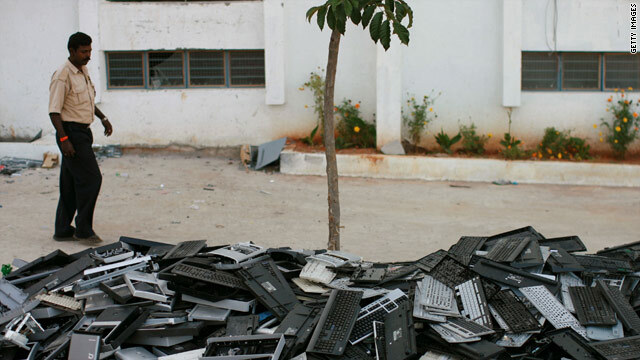 Some drives have left nonprofits with more phones than they could use and, environmental advocates say, those phones often end up in the dump.